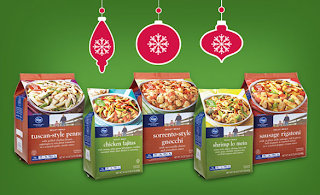 Get Cyber Monday Crazy w/ Coupons.com! This Fashion In The Forest post is a Fashionista Event. I was provided a promotional item by Coupons.com to inform you of their crazy insane Cyber Monday Sales, Coupons.com Cyber Monday giveaway and our Cyber Monday $500 giveaway. Good Luck Everyone! I don't know about you, but I absolutely love shopping on Cyber Monday. Shopping in the comfort of your own home, not having to fight the crowds...and, of course, those amazing Cyber Monday Sales! It's absolutely perfect. I always check Coupons.com for coupon codes when I shop online; just because I'm already saving money shopping online doesn't mean I can't save a little more! 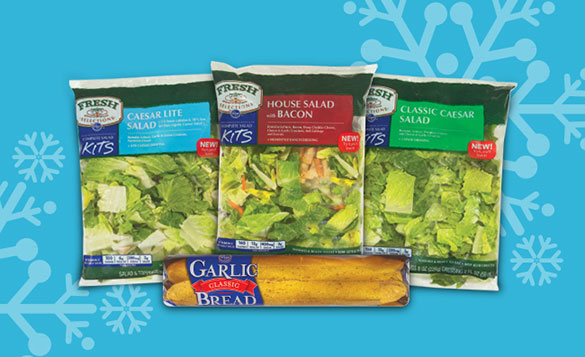 Coupons.com is going to help me get the most out of my money this holiday season. Did you know that they're hosting a Cyber Monday Sweepstakes? That's right! Coupons.com is giving away a $ 500 Amazon Gift Card. Think of all the gifts that could buy! The contest starts November 25th and runs until December 2nd. You can bet I'll be entering to win first thing tomorrow! I've got more good news to share with you. Are you ready?? My fellow Fashionistas and I are hosting a giveaway where two lucky people will each win a $250 Amazon Gift Card, courtesy of Coupons.com! Our giveaway runs along the same time as the one featured on the Coupons.com website so don't forget to enter both amazing giveaways! I've got my shopping list, I've checked it twice....I'm SO ready to get my shop on this coming Cyber Monday. 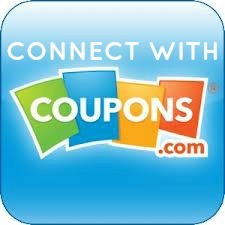 Do yourself a favor and check out all the amazing features on the Coupons.com website. Thanks to all the great deals & coupon codes I've found, I feel very prepared to shop for what I need to ensure my friends and family have a wonderful Christmas. 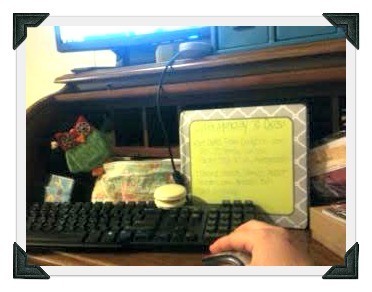 Speaking of friends and family, I've got to tell mine about the Coupons.com Amazon Gift Card Giveaways! Don't forget that there's one here AND one on Coupons.com! Wouldn't it be nice if you or someone you knew won?! Make sure to share this great giveaway with your friends and family too! 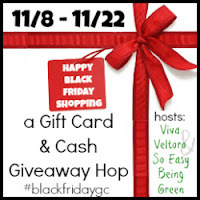 Welcome to the Black Friday Gift Card Giveaway Hop hosted by Viva Veltoro and So Easy Being Green! I've joined a fabulous group of bloggers to bring you the chance at winning Gift Cards and Cash to make your Black Friday Shopping even more fun! Each giveaway is for either a gift card OR PayPal cash and will end exactly one week before the Shopping Holiday! Make sure to hop around to them all & increase your chances of putting money in your pocket! The Giveaway Hosts (So Easy Being Green, Viva Veltoro, & Sampler) aka the hosts of the Ultimate Online Baby Shower, are offering one lucky Grand Prize Winner the opportunity to shop on Black Friday at Target...with a $100 Gift Card! 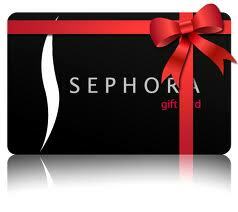 Gift Card participating bloggers are not responsible for sponsors who do not fulfill prize obligations. Kid's Academy is one of the most successful developers of apps for kids & they have released what might be their biggest app yet. 123 Tracing is an excellent educational app designed for younger students. This awesome game helps kids trace numbers and get in the habit of writing and forming these letters that they will use the rest of their lives. The free version of app is live and available to download via iTunes, Google Play and Amazon now! Kid's Academy is all about helping children learn verbal, writing and math skills in an easy and fun manner. Apps such as 123 Tracing and Bingo ABC have been top-50 educational apps in the App Store. Kid’s Academy has also brought the well-known stories and nursery rhymes, such as The Three Little Pigs and Five Little Monkeys, to life with interactive apps. The simple interfaces of the apps allow children to take the reins and play on their own, but the sing-a-longs and other activities are perfect for parent or teacher engagement as well. Research has shown that singing along with nursery rhymes has cognitive and physical benefits for children. Not only are children learning new words and the context in which to use them, but strengthening tongue and mouth muscles at an early age will help with pronunciation skills. Kids Academy is an early childhood education start-up specializing in development apps for major mobile markets such as the App Store, Google Play and Amazon. The rapidly growing company is bringing value through education for children aged 2 to 6 teaching kids numbers, upper-case and lower-case letters, word-letter associations, phonics, and spelling....all the while bringing them endless fun and excitement through play activities. Founded in the end of 2011 with the first application released in July 2012, Kids Academy has six fantastic apps and recently reached 2 million downloads. The apps developed by Kids Academy received numerous positive reviews and were top rated by Children’s Technology and Parent Reviews. Interactive ABC by Kids Academy was featured by The Guardian in mobile tech review as well! Celebrate RocksBox's first Birthday with 15% off gift memberships & purchase credit! Just use code "ICING" to get that fabulous discount! On top of that, if you're a new member, you get $10 off your first box! 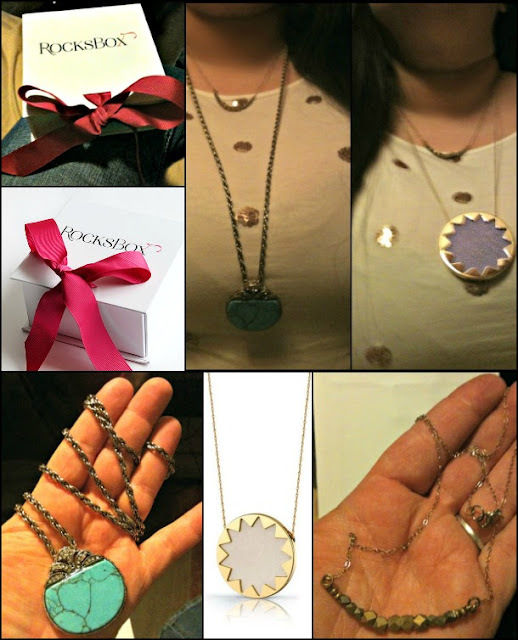 Click here to check out RocksBox today! Here's what I got in my first RocksBox! The Sunburst Pendant Necklace in Sapphire Blue Faux Stingray is by House Of Harlow 1960 (top right & bottom middle photos) and retails at $46.40. It's a lovely lavender color and the disc is quite large, about the size of the bottom of a soda can. It's lightweight, though, and completely gorgeous up close. The Sia Gold Filled Necklace from Salty Fox Jewelry (top right & bottom right photos) retails at $70.40. This necklace is extremely lightweight and delicate on the skin. As you can see from the photos, the necklace is short in length. My favorite out of the box was the Sunday At The Windsor Pendant by Samantha Willis (top right & bottom left photos); it also happened to be the most expensive, retailing at $124. Apparently I have expensive taste! It's a gorgeous genuine turquoise pendant with crystal detailing and features a large twist chain. I felt like this piece was an updated 1920's style and I loved it! The cool thing about RocksBox is that you're kind of renting the jewelry. Keep it & wear it until you're over it (or want to buy it). Send the pieces you don't want anymore and RocksBox will send you new pieces! There's a feedback sheet with each box that let's you decide whether you liked, loved, hated or want to buy the pieces. Send that in with your box and that helps personalize what they'll send you next! Check out RocksBox today! Remember, new members get $10 off their first box and that you can use code "ICING" to get 15% off all gift memberships & purchase credit! #ad When I was younger, I always wished that I could go to summer camp. You'd see these movies and read stories about how fun summer camp's were, how you'd make amazing friends there. I wanted to go so badly. Unfortunately, I never got to. Fast forward to present day and now it's time for my friends' kids to start going to camps. Finding summer camps for teens can be a daunting process, but with the right research it's totally possible. There are many different types to choose from: academic, creative, special needs, performing arts, community service, sleep-away, sports, wilderness and language study, to name a few. Tips On Trips & Camps is a free service that provides expert advice on overnight camps and trips for ages 8 to 18. They provide a quick and easy way for busy parents to find quality summer experiences for kids, tweens and teens. They recommend carefully screened, quality summer programs throughout the USA and abroad, with their expert advisers guiding you through your decision from start to finish. Let the wonderful people at Tips On Trips & Camps help you find the right camp for your kids today! Fortune Girls - Empowering Girls To Dream Big! #adFortune Girls is about empowerment. Fortune Girls is a MOVEMENT! They remind us that if you dream big then you can get big things done. They strive to remind young girls that they are each special and unique in their own way and that it is so very important to believe in yourself. The Fortune Girls were created by tween Madison Ruiz and her mother; with the mission, concept and characters created with a single goal in mind… to create a lifelong recipe for personal success. They want to empower young girls and encourage them to think about how they can make a difference, not only in the world, but in themselves as well. The international characters are super funny, quirky…..much like the average teen girl! What Fortune Girls Is All About. The Fortune Girls are in the midst of their Kickstarter campaign and soon the website will contain content and games, animations, and much more! They want to invite all tween girls and their friends to join them on this exciting journey! If you'd like to donate to their Kickstarter campaign, click here. Every little bit helps! Fortune Girls is honored to introduce the multi-talented 8 year old Chalet Lizette Brannan as our Fortune Girls Celebrity Tween Ambassador! Chalet is a true Fortune Girl as she's following her dream. Check her out in three new projects! She’ll play Sarah Moon in the Western movie “Ride The Wanted Trail” and Delilah, who will be the mini-me of country singer, Caroline Rich in her new sitcom “Swallow Your Bliss”. This show will take aim at the food cooking shows. Also, in theaters next Summer, “A Horse For Summer” with stars Dean Cain (Superman) Christopher Atkins (Blue Lagoon) and former USA Beauty Pageant winner, Lee Meriweather (Catwoman). It's almost time for Black Friday! I can't wait! I go every year and I love it. It feels like a game show to me, like Supermarket Sweep or Shop Til You Drop, racing around trying to get good deals! Find&Save is the perfect destination for Black Friday shoppers. Use Find&Save to plan and maximize your shopping experience. Find&Save arms shoppers with the tools they need to research local sales, products and retailers in their area, find the deals that are important to them, map store locations, create shopping lists & get deal alerts. 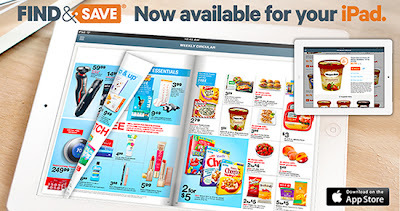 Find&Save is available across all tablet, mobile and web browsers, as well as on Find&Save® for iPad, with Find&Save for iPhone coming soon. Are you a Night Owl shopper or an Early Bird shopper? Me, I'm a little of both as I go to the evening sales on Thanksgiving Day as well as the early morning sales on Black Friday. 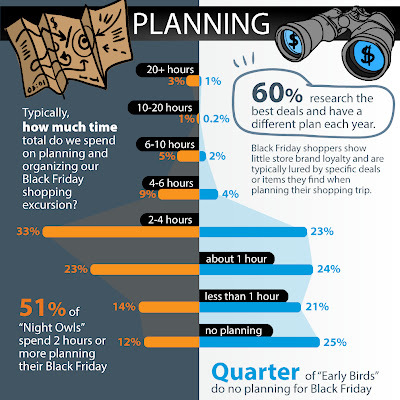 Most people put a lot of planning into their Black Friday adventure. Find&Save has done extensive research to bring you the most detailed survey information about Black Friday shopping patterns, brand loyalty, motivations and time spent shopping. It's a really fascinating read, which you can view here. This is just a small example of all the detailed information you'll find in the article. Consider Find&Save your window to local savings. I've been using the site on my PC and can't wait for it to arrive for iPhone. 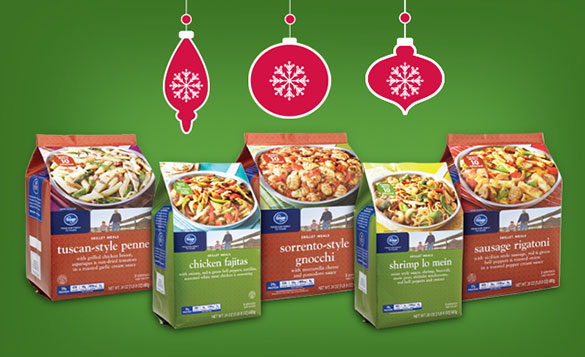 There's nothing like finding a good sale --- and with Find&Save, it couldn't be easier! This is a compensated post powered by Sverve. All opinions are my own. It's getting COLD here! What's the weather like in your neck of the woods? Today's coupon roundup includes some great movies, tons of beverage deals plus a few extras thrown in.